If you are unsure which member of the group to contact for a specific issue, you can try the group's generic email account: gav@uop.gr. 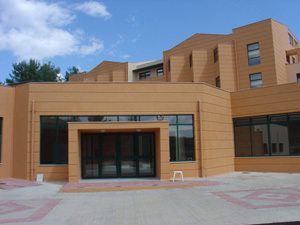 ΓΑΒ LAB is located on the ground floor of the Faculty of Economy, Management and Informatics building at Sehi, which is part of the University of Peloponnese Campus in Tripolis. The University Campus is approximately 2Km from the centre of Tripolis and is best reached by bus, car or taxi. Make sure to get to the building at Sehi (commonly referred to as the Economics building). Use the gate pictured below to enter the building and turn right to find us.